Though my poor sweet tooth protests, I really don’t eat much dessert these days. When I do, it’s almost exclusively raw. And pretty minimalist. Just give me a thin-sliced frozen banana and a few spoonfuls of almond butter, and I’m a happy lass. We are currently at the peak of apple season, and if you’d have told me 5 years ago that apples were to become my favorite fruit, I’d have called you a crazy person. Yet . . . here I am with this unquenchable adoration. I blame the Pacific Northwest, and the exquisite apples that grow here! 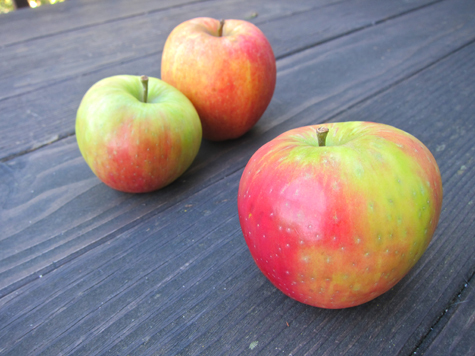 My favorite variety, hands down, is the Honeycrisp. And this year’s crop, which I’ve been snatching up each weekend at the Farmer’s Market, well . . . hoo-boy! These are so juicy, so crispy, so explosively flavorful it makes me want to cry. Seriously, it’s a profound emotional experience to eat something so pleasing! It would truly take a special treat to honor these autumn treasures. 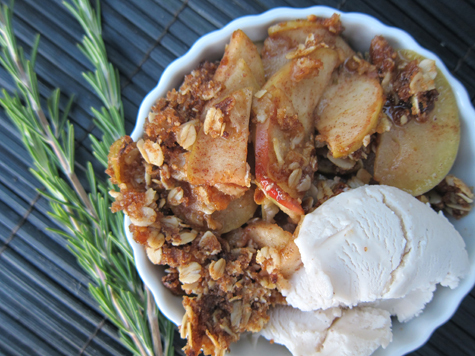 And apple crisp, warm and brown sugary and nostalgic of childhood, seemed just the ticket. Of course, it would need a twist to really do these apples justice. Enter Miss Rosemary! Preheat oven to 350º. Using your fingers, grease a small baking dish with coconut oil to. *Please note this recipe is on the small side and bakes best in a bread loaf pan. If you’re feeding more than 4 or if you want leftovers, you should double it. Slice the apples ~1/4 inch thick. In a mixing bowl, combine the apples with the next six ingredients (through nutmeg). Toss thoroughly and then transfer this mixture to the baking dish. In another bowl add the final five ingredients and mix until it forms a small crumble. Spoon this on top of the apple mixture. Bake at 350º for 30-40 minutes, until the top is a bit browned. Serve warm with vegan ice cream (I used hemp of course). Try not to cry, ha! Oh this recipe looks so good! But then, I’ve always been an apple girl! Living at the foot of a mountain quite covered in apple farms will do that I guess, haha. All the apples I could ever eat just a few (beautiful) miles away. And organic gets a little easier to find every year! Yay! yummy! I have never heard of a honeycrisp apple. I will have to look out for those at the market. Do you make the ice cream yourself? Never heard of hemp ice cream either! Learning new things everyday! @ Adrienne Audrey – Mmm, hemp ice cream is delectable, one of the most authentically creamy of the non-dairy options. I love Tempt by Living Harvest. I made this today! The apple goo was delicious, although my crust was dry– I used steel cut oats and I guess it doesn’t work well as a substitute. Also, I combed through Whole Foods looking for hemp products because of that great hemp entry you wrote earlier, and I could only find hemp milk! Can you tell me where you buy your hemp food products? Thanks! Oh, the new photos look fantactic! Ace work! Tried this with a local sweet/tart type apple and coconut milk ice cream and ohmygoshguys so awesome! Thanks for the recipe! Sorry for all the exclamation points, I get excited about apples, lol. Oh I’m such an apple girl. I don’t go a day without at least one (okay, I confess, there have been a couple of days like that this year) and it has been like that for a very long time. I don’t know what’s with the apples and me but we go together. Considering all that, it’s extremely weird that I only eat them raw and by themselves. The time has come! I will try this, I promise! Soon, very soon. Most recipes seem daunting for me but this doesn’t seem that bad, I already have some ideas how to substitute some of the tiny things I don’t have. Thank you for the recipe! Yum! that`s a great idea for a delicious meal! Although apples + oven pretty much can’t go wrong. I’m so happy to hear that you guys are making this! Ain’t it delish? @ Julia – Yeah steel cut oats take a lot longer to cook so they probably couldn’t substitute. I bet that was a really crunchy top! Really, your WF didn’t have hemp seeds or protein powder or hemp oil? That’s a bummer! I get my hemp stuffs at my co op. Is there an independent health food store in your area? Or else, there’s always the internet! @ Meghan – Let me know how the instant oats work if you do. Recipes always say not to sub so I never have, but I always wondered . . . Thanks so much for posting. I can’t wait to make it and eat it too! This looks delicious! I’m just clearing out my stash of autumn stores…I have a few apples remaining in the bottom of my bulk food stash, and I’m thinking this sounds like the perfect dessert for book club tonight. Thanks so much. Your site is gorgeous, by the way! 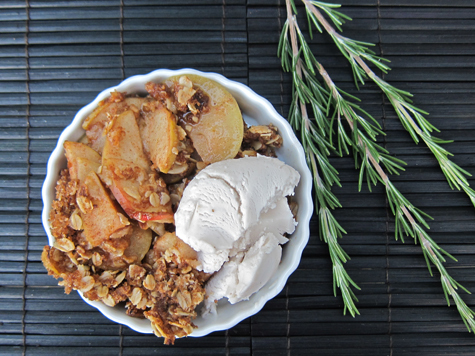 I was looking for a vegan apple crisp recipe and this one looks amazing! Any chance you have nutritional information? I’m putting the apple crisp in the oven right now in this moment!!!!!! Can’t wait to taste the yumminess! Let you know in awhile.